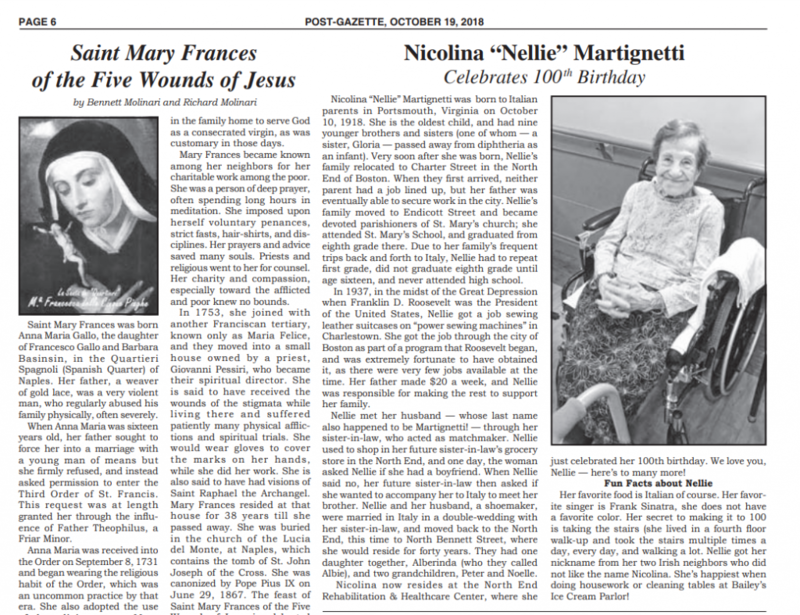 Nicolina “Nellie” Martignetti was born to Italian parents in Portsmouth, Virginia on October 10, 1918. She is the oldest child, and had nine younger brothers and sisters (one of whom – a sister, Gloria – passed away from diphtheria as an infant). Very soon after she was born, Nellie’s family relocated to Charter Street in the North End of Boston. When they first arrived, neither parent had a job lined up, but her father was eventually able to secure work in the city. Nellie’s family moved to Endicott Street and became devoted parishioners of St. Mary’s church; she attended St. Mary’s School, and graduated from eighth grade there. Due to her family’s frequent trips back and forth to Italy, Nellie had to repeat first grade, did not graduate eighth grade until age sixteen, and never attended high school. In 1937, in the midst of the Great Depression when Franklin D. Roosevelt was the President of the United States, Nellie got a job sewing leather suitcases on “power sewing machines” in Charlestown. She got the job through the city of Boston as part of a program that Roosevelt began, and was extremely fortunate to have obtained it, as there were very few jobs available at the time. Her father made $20 a week, and Nellie was responsible for making the rest to support her family. Nellie met her husband – whose last name also happened to be Martignetti! – through her sister-in-law, who acted as matchmaker. Nellie used to shop in her future sister-in-law’s grocery store in the North End, and one day, the woman asked Nellie if she had a boyfriend. When Nellie said no, her future sister-in-law then asked if she wanted to accompany her to Italy to meet her brother. Nellie and her husband, a shoemaker, were married in Italy in a double-wedding with her sister-in-law, and moved back to the North End, this time to North Bennett Street, where she would reside for forty years. They had one daughter together, Alberinda (who they called Albie), and two grandchildren, Peter and Noelle. 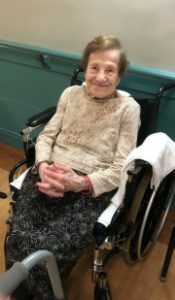 Nicolina now resides at the North End Rehabilitation & Healthcare Center, where she just celebrated her 100th birthday. We love you, Nellie – here’s to many more! How she got her nickname: Her two Irish neighbors across the street didn’t like the name Nicolina, so they began calling her Nellie – and it stuck! She’s happiest when… doing housework OR cleaning tables at Bailey’s Ice Cream Parlor!